In this sixth-grade science class, students will begin to understand what the greenhouse effect is and how it is connected to global warming. Explain how the greenhouse effect contributes to global warming. Experientially explore how greenhouse gases trap heat in the Earth’s atmosphere. Make the reusable name tags mentioned in materials. Welcome students and introduce the Greenhouse Lab. Let students know that they will be taking a break from their garden jobs today to visit the Greenhouse Lab. Comment on the fact that they are studying Energy and Heat in their classrooms. We have a greenhouse in our garden – has anyone seen it or know where it exists? Does anyone know how the greenhouse works? Has anyone heard of the phenomenon called the “greenhouse effect”? How is it connected to global warming? Go over the garden jobs. Focus attention on the Job Board and exhibit team teaching. From their seat in the circle, each garden teacher gives a brief description of the garden job they will be leading that day. One working group should harvest and prepare garden produce for a class tasting. Mention that students will be doing a tasting and a Give One, Get One activity with two different sentence frames during Closing Circle. Have a volunteer read the sentence structure out loud. Divide students up into small working groups. Student groups take a break from their garden jobs and participate in the Greenhouse Lab activity. 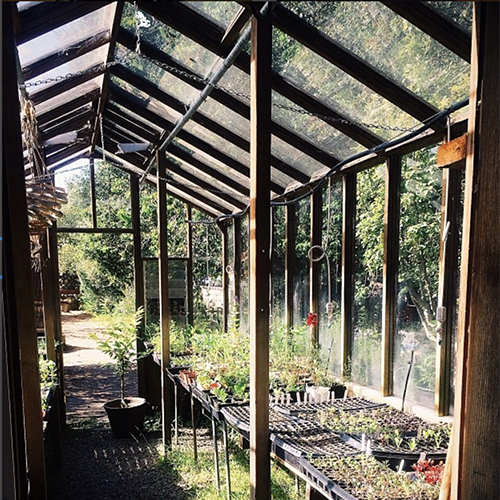 Direct students into the greenhouse for two minutes of exploration, encourage them to experience the space. Inquire about any observations. Gather the students together just outside the greenhouse. Ask if there is a volunteer willing to explain – in their own words – the greenhouse effect. Assign some of the students the role of "Heat" and others the role of "Greenhouse Gases." Just be sure that there are more "Heat" students then "Greenhouse Gases" students. Hand out name tags and have students put them on. Inform “Greenhouse Gases” students that they can choose what kind of gas they are for the game. The top five greenhouse gases are: water vapor, carbon dioxide, methane, nitrous oxide, and ozone. Label the far side of the area the "Sun" and the area inside the greenhouse "Earth." "Heat" students should stand at the "Sun" end of the space while two of the "Greenhouse Gases" students should stand in the middle (outside the door of the greenhouse.) Other “Greenhouse Gases” students can wait and watch on the sidelines. Remind students that the sun produces heat waves that reach the Earth’s surface. Ask students to wiggle their arms in a wave motion to represent the oscillation of heat waves. At this time have the "Heat" students walk from one side of the space to the other, demonstrating heat traveling from the sun to the Earth. Explain that most heat escapes back into space while gases in the atmosphere trap some of the heat. These "greenhouse gases" allow the Earth to stay warm and allow life to flourish. We’re using the word “trap” as that’s one way to scientifically explain it (have the “Greenhouse Gases” students point to the “Heat” student they wish to “trap” and say, “Trapped”). To demonstrate this, have the "Heat" students “bounce” off Earth and travel back to the other side of the space, but this time the "Greenhouse Gases" students each trap one "Heat" person, keeping them on the "Earth" side of the space, allowing the others to "escape." Students need to be aware that the greenhouse effect is a beneficial, natural process and that without it the Earth would be too cold to sustain life. Now introduce the idea that things are changing on Earth, and there are now more greenhouse gases. Have all the remaining "Greenhouse Gases" join the other "Gases" in the middle of the space. Ask the students to predict what would happen when more greenhouse gases are added to the atmosphere. Again, have the original group of "Heat" students travel from the "Sun" side to the "Earth" side of the space. Then ask the "Heat" students to try to travel back to the other side of the space. The "Greenhouse Gases" students should then each trap one "Heat" student. Since there are many more “Greenhouse Gases,” more "Heat" will be trapped on Earth, with very little, if any, "Heat" escaping. This is how global warming happens. Students "Walk and Talk" back to their garden job. Pair students for the "Walk and Talk." Prompt them to discuss the question: How do greenhouse gases get into our atmosphere? When you reach your destination (if necessary, take the long way to give students more time to talk) have a quick circle up and ask students to share out what they talked about on their walk. Facilitate a discussion on the difference between human vs. natural contributions to greenhouse gases: human impacts such as fossil fuel combustion, and natural processes such as changes in incoming solar radiation, volcanic activity, or forest fires (cow farts is a popular one). The top five greenhouse gases are: water vapor, carbon dioxide, methane, nitrous oxide, and ozone. Ask students to reflect on the lab using the sentence structure written on the whiteboard. “At opening circle I thought _________, and after going through the greenhouse lab I now think ________. I think my garden job of __________ is related to global warming because it ____________." We have found this game effective and fun in conveying the concept of the greenhouse effect. While it is not essential to do it in or near a greenhouse, it sure does make it more interesting. We designed the game as something that allows you to participate interactively with the concept of the greenhouse effect but doesn’t devolve into students grabbing or holding each other. Ask questions to clarify evidence of the factors that have caused the rise in global temperatures of the past century. Edible Schoolyard students and teachers are mindful of bio-diversity as it pertains to the ecology of the garden, the development of food throughout history, and within our own faculty and student body. We explore the garden as an ecosystem and understand that embracing and preserving diversity builds a strong, healthy, and resilient planet.